How would you like the next version of Mozilla Firefox UI to look ? Would you like it to have a spartan look and feel similar to Google Chrome ? Or should it be an amalgamation of all the good UI ideas found in different browsers like Opera, Internet Explorer 8.0, Safari and Google Chrome ? Mozilla Firefox has initiated a discussion on how the UI of Firefox 4.0 should be designed. It has put together a couple of ideas as mockups. These mockups have not been finalized but are shared with the public to initiate a discussion and for brainstorming. Should Firefox 4.0 have tabs on top of address bar or on bottom of address bar like in Google Chrome? Should it have a combo stop/refresh/go button ? 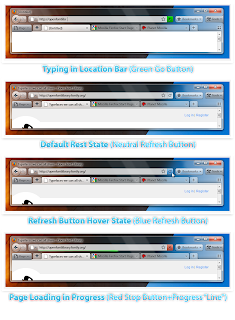 Check out the mockups of Firefox 4.0 and also the feedback received. Maybe, but they can be a bit inefficient, since the combo button has a tendency to hang.